This article in the Independent caught my imagination back in March. 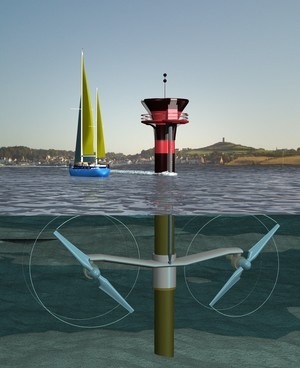 A company called Marine Current Turbines is using their SeaGen project (pictured) to generate electricity from the tidal movement of water in and out of Strangford Lough in Northern Ireland using underwater turbines. This morning I spotted Tom Shelley’s article over at Eureka Magazine – electricity generation is about to commence! After some installation delays, the first electric power should be generated on Friday 4th July. This 1.2 MW project is only the start too; a 10.5 MW project is planned for the waters around Anglesey in Wales. I just love the concept of these underwater windmills, reliably spinning away to generate electricity sustainably, regardless of the weather. It’s suggested that the SeaGen technology should have far less impact on the marine environment than would a tidal generation project such as the Severn Barrage, AND there are a host of potential SeaGen generation sites. Personally, I wish them the best of luck. 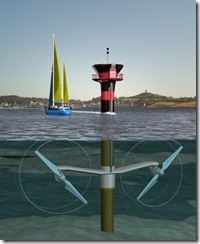 I agree with you about this great idea of using underwater turbines. On Anglesey people are generally well disposed to the idea. We have some very tidal waters around the island and I know that MCT have looked extensively at the stretch of waters called the Langdon Ridge between Skerries Lighthouse and Carmel Head, the north western tip of the island. Here the tidal race is very strong and I am not surpirsed that this could well be where they will locate up to seven 1.5MW turbines giving a total output of around 10.5MW. So following on from Strangord Lough let’s hope MCT get to make full use of the Anglesey tidal power off our coast.